While US sanctions against Turkey have dominated news headlines, recent selloff of Turkish lira is a vote of dissent to the policy of the new government. After his “re-election”, President Tayyip Erdogan has grabbed tighter control of the economic and monetary policies. However, the policies implemented have failed to alleviate the most serious problems facing the economy, namely high inflation and rapid currency depreciation. Rather they have exacerbated the problems. We agree that the latest US sanctions has further eroded market sentiment. 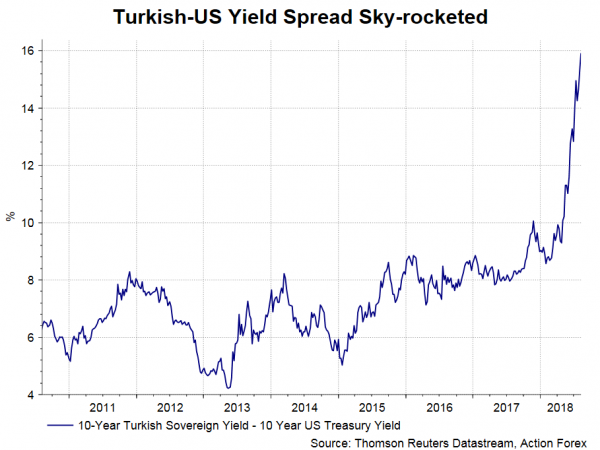 However, even if a deal is eventually reached, the policies dictated by President Erdogan would remain the biggest hurdle to investors’ confidence over Turkish economic and financial situations. Turkey’s GDP growth has even outpaced that of China since 2H17. The economy expanded +7.4% for the full year of 2017, and is expected to ease to about +4% this year. However, the surge in household consumption and business investment were mainly motivated by fiscal stimuli. Accompanying the robustness in economic activities is the sky-high inflation. Headline CPI surged to +15.8% y/y in July, significantly higher than the +5% target. Core inflation, which excludes volatile items such as food, energy and gold, also rose to +15.1%, from +14.6% in June. Ironically, the central bank decided to keep interest rates on hold at the July meeting, compared with consensus of a +100 bps increase. Indeed, lira was dumped immediately after the announcement. After being “re-elected” as the President in June, Erdogan has deepened his control over the economic and the monetary policies. Besides appointing his son-of-law as the finance minister, Erdogan declared that, as the President, he assumes the authority to appoint the central bank governor, deputies and monetary policy committee members for a 4-year period. Describing himself as an “enemy of interest rates”, a central bank controlled by Erdogan has refrained from hiking interest rates despite elevated inflation and the fact that the Fed would continue to raise the policy rate this year and in 2019. Indeed, the central bank has continued to increase liquidity. Earlier in the week, it announced change in reserve option coefficients (ROCs), lowering the upper limit for the FX maintenance facility to 40% from 45%. According to the central bank, it expects around US$ 2.2B of liquidity to be provided to the financial system to “support price stability and financial stability”. The move is contrary to conventional wisdom of tightening liquidity in order to curb inflation and defend exchange rate. The robust economic growth has been sponsored by fiscal stimuli, which are in turn financed by debt. Debt-ridden Turkey is facing twin deficits and huge external debts. In 2017, current account deficit reached about US$ 47.1B, about 5.5% of GDP. Moreover, external debt amounted to 53.3% of GDP, of which 70% was attributed to the private sector. Recent US sanctions have inevitably dent confidence of both consumers and investors, as many are concerned about the ability of the government and the corporate to borrow. 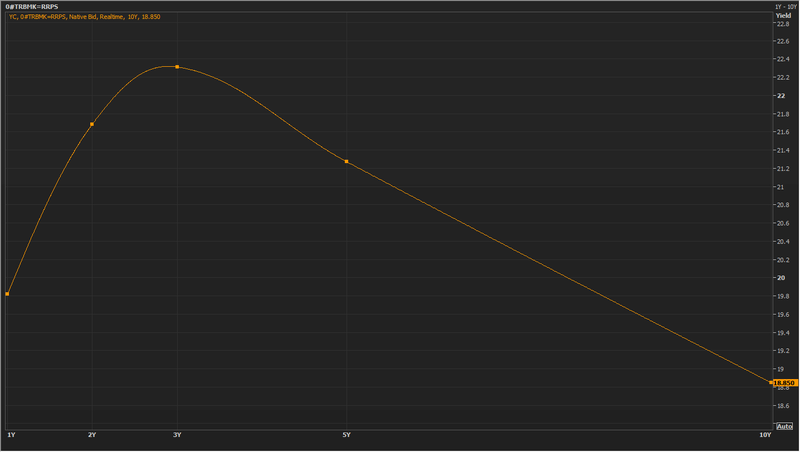 Currently trading at 371 bps, Turkey’s 5-year CDS had jumped from Thursday’s close of 349.94. 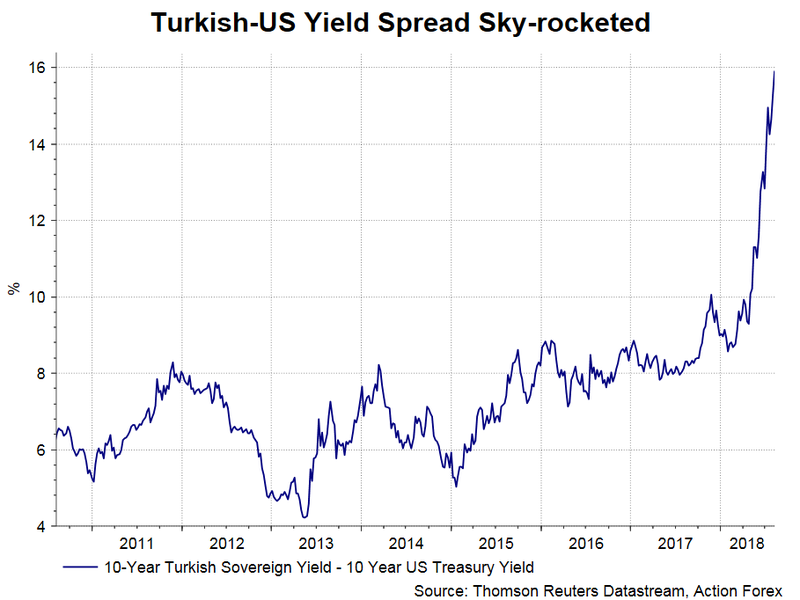 Meanwhile, sovereign debt yields spread between Turkey and US have widened to almost a decade high, reflecting higher borrowing costs for the former. The inverted yield curve structure has raised concerns that recession is coming after rapid growth that are unsupported by underlying fundamentals.